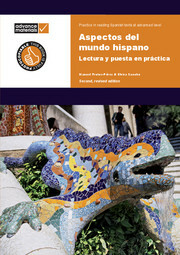 Complements advanced level Spanish course books by providing practice in reading and understanding longer texts. This practical photocopiable resource supports teachers in developing their student’s vocabulary needed to understand and talk about important issues in the target language and is suitable for AS/A2 level, IB Diploma Language B and AP level. The eight photocopiable self-study units are based on authentic texts dealing with a range of topics. Lively, interesting and carefully graded, the exercises include identification of key words, comprehension questions and focused practice with the new vocabulary, grammar and phrases. 'Correcciones y explicaciones' handout sheets promote self-assessment. Grammar and shades of meaning are explained simply but thoroughly, helping students develop their language skills rapidly. Encourages an analytical mode of study. Self-Study Units allow student development without close work with a teacher. Correcciones y explicaciones' sections provide explanations in addition to answers. Simple structure complemented by extentsive content. Provides engaging content with contextual Hispanic issues.